I decided on throwing Kennedy a Vintage Circus 2nd Birthday Party because I know how much she loves to be outside and how much she loves clowns so I thought it would be very fitting. The movie water for the Elephants was my main inspiration, I loved the look of the 1930s circuses the costumes the decor. Her Ringmaster costume was also my inspiration. I made all her outfits. I made the food stands out of pallets, the sign stand, all the bunting banners, the elephant banners, and I made the confetti banners from paint samples. I made the costumes, the game set ups. I purchased the packaging for the food such as: fries, peanuts, popcorn, pickles, corn dogs and hamburgers all off of Etsy. Cotton candy bags, Gumball machine 36" balloons and popcorn machine all came from Amazon. The invitations and labels and paper banners came from the shop little mountaintop off of Etsy. I did alot of goodwill and antique shopping. I used a lot of the baskets and fabric I already had laying around. My favorite item would have to be Her Ringmaster/trapeze outfit I made. 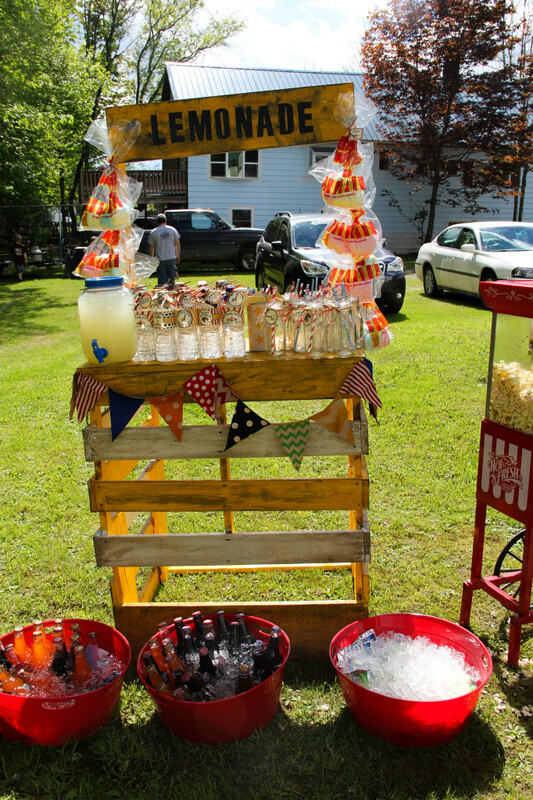 The popcorn cupcakes and caramel apples I made and the food stands all set up. If you have the time. Make a lot of the stuff or shop around for great deals. I made most of the stuff and it was my own personal touch for her party. I hope you enjoy Kennedy's Vintage Circus. Completely adorable party! Well done Mom!!! WOW excellent job Mom!!! I’m a DIY crafter and I sew, but wow! This would be a tall order even for me and I’m obsessive. Very impressive! This is awesome! Where did you get the tin bucket she stood on? and how much? How did you make her ringmaster outfit? Bravo, the costumes are very nicely done (quite professional I must say)! Are you entertaining offers for orders of your custom circus attire? I would very much like to purchase Ringmaster and Strong Man costumes for my son’s upcoming circus party (size 2), your work is the best I have come across thus far. I am getting my daughters 2nd birthday party together and came across your daughters outfit. Are you interested in selling the ringmaster outfit? It is beyond adorable- nothing that I have seen compares.. Love it! Hello Everyone thank you all for the kind words!! I am taking orders on custom costumes. Sorry I just noticed I had comments on here. The best way you can reach me is my Email [email protected] my Facebook I do not use the new messenger unless you post on my time line. Thanks again. I read a comment on where I got the tin. I picked it up at a tractor supply store spray painted it gold and painted the design on it and flipped it over.I also made all props, banners, tassels, food stands, signs etc. If interested in anything please don’t hesitate to email me. Thank you!! How did you make that jacket?